Ballymena United players Leroy Millar and Caolan Loughran pose with the League Cup trophy in front of supporters. 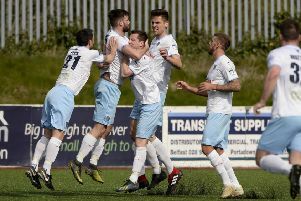 Pic by PressEye Ltd.
Lifelong links to the Ballymena United fanbase left Leroy Millar and Caolan Loughran often trailing the rest of the team during the post-match celebrations, WRITES PATRICK VAN DORT. However, any short-lived delay in playing catch-up should be considered something of a rarity given the rapid rise of both from the club’s Academy ranks to the senior stage. The connection between the two homegrown heroes and the supporters was both genuine and gracious as the two young players crossed the physical divide from the Seaview pitch into the stands to share the moment with fellow fans. Having taken time to pose for ‘selfies’ and mix with the supporters, both Millar and Loughran were keen to express the pride felt at having taken that key leap from the terraces to the first-team squad. “It is my first cup final in the squad and I remember feeling devastated at missing out last season on the County Antrim Shield final panel,” said Millar on the pitch in his post-match interview. “The Ballymena fans are the best and they just give it everything so when we win it is better and better sharing it with the supporters. Loughran described the 2-0 win over Carrick Rangers as “one of the best days of my life”. “It’s just amazing,” he said. “It’s great for the club and I was watching the County Antrim Shield final from the stands as a fan. Millar supported his former Academy colleague’s view of the cup win as path to the next stage. “We will just take each game as it comes but the younger players can learn so much from other more experienced players,” he said. “I try to emulate someone like Jim Ervin and I was delighted to see Allan Jenkins score as he is always offering the younger players advice. “There are so many top professionals,” he added.